Robert Half webinars, featuring top industry experts, help financial professionals address their most challenging issues through open, solutions-based discussion. As the economy improves, even incrementally, the fortunes of accounting and finance professionals remain on an upward trajectory. While good news for today’s professionals, hiring has become increasingly challenging for employers, which need staff who combine functional expertise and outstanding soft skills, can turn data into strategic guidance, are regulatory experts, and contribute to decisions affecting all areas of the business. The webinar qualifies for one unit of continuing professional education. The Obama administration announced it will delay until 2015 the employer mandate of the Patient Protection and Affordable Care Act (ACA). But employers can’t simply tune out until 2015. The Act’s employer mandate has been deferred, not repealed. All other elements of the ACA remain in effect with their original deadlines, including a variety of requirements that take effect on January 1, 2014. And insurance marketplaces will be open for business on October 1, 2013 -- less than 3 months from now -- in time for open enrollment. Smart companies are using the delay of the employer mandate to get a head start on their compliance efforts. Join our Webinar on July 24, with leading ACA expert Alden J. Bianchi, author of "What Every Business Needs to Know About the Patient Protection and Affordable Care Act." This webinar qualifies for one unit of continuing professional education (CPE) credit. No prerequisites or advance preparation are required. Robert Half International is registered with the National Association of State Boards of Accountancy (NASBA) as a sponsor of continuing professional education on the National Registry of CPE Sponsors. State boards of accountancy have final authority on the acceptance of individual courses for CPE credit. Complaints regarding registered sponsors may be submitted to the National Registry of CPE Sponsors through its website: www.learningmarket.org. For more information regarding the refund, complaint and program cancellation policies, please contact our offices via email at cpeprograms@rhi.com. A panel of experts from Robert Half and Protiviti will discuss key considerations as companies grow rapidly. Whether through business expansion, a successful IPO, merger or acquisition, any company considering one of these strategies must prepare a solid foundation to enable a successful and smooth transition. This event is designed to frame these liquidity activities in the context of a long-term strategic plan for growing companies. Benchmarking is a critical first step in evaluating and improving a company’s financial operations. Having access to information about how other firms manage their finance function can help you identify opportunities for improvement and create best practices that suit your unique circumstances. This webinar will allow accounting and finance executives to more easily compare their own operations with peer companies and gain insights into new and innovative enhancements that can help to improve performance. The recorded version of this webinar does not qualify for CPE credit. Financial Forecasting -- Are You Prepared for Today’s Changes? Planning and Budgeting Strategies for Optimal Performance and Competitive Excellence. From cyber threats to succession challenges, integrating risk into performance planning is critical in today’s business playing field to succeed and stay ahead of the competition. Add in sweeping regulatory changes, economic uncertainty, and market volatility and companies will sink or swim depending on how they attack such hurdles in the quest for optimal performance. In this one-hour, free CPE webinar (qualifies for one unit of CPE credit), leading experts from Robert Half, Protiviti and the Beyond Budgeting Round Table will share best practices on how to manage the financial planning and budgeting processes. Who will benefit from this discussion: Accounting and finance professionals involved with the financial planning and budgeting processes (CFOs, VPs of finance, controllers, assistant controllers, budgeting directors, financial analysts, accounting managers) from companies of all sizes. This recorded version of the webinar does not qualify for CPE credit. 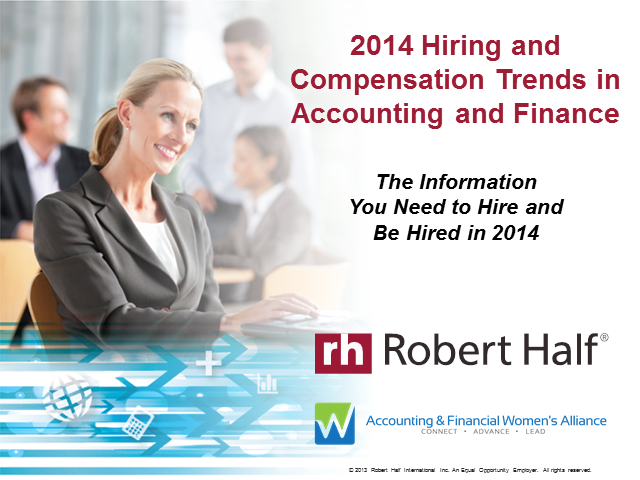 As we head to the new year, the accounting and finance employment environment remains dynamic. While some firms are taking a measured approach to hiring, others are adding personnel to support growth. At the same time, talent shortages persist, giving a leg up to professionals in high-demand specialties. Career and hiring expert Paul McDonald of Robert Half will co-host the session with ASWA executive director Lee Lowery. They will be joined by panelists Kelly Battles, CFO of Host Analytics; Raymond Castonguay, senior vice-president, finance at Morneau Shepell; and Vivian Moller, CFO of HY Connect. The on-demand version does not qualify for CPE credit.